These pontoon boat seats make up our Classic CG1814 pontoon furniture set. Can I get length of all seats. My boat is I storage and need to measure because I don't have front seats etc. I just have chairs. I don't need the captains counsel is that a option? To best be able to help you we will need some measurements to give you the best possible replacement seating options. I have included a link that explains in detail how to mesure for your new pontoon boat seats. 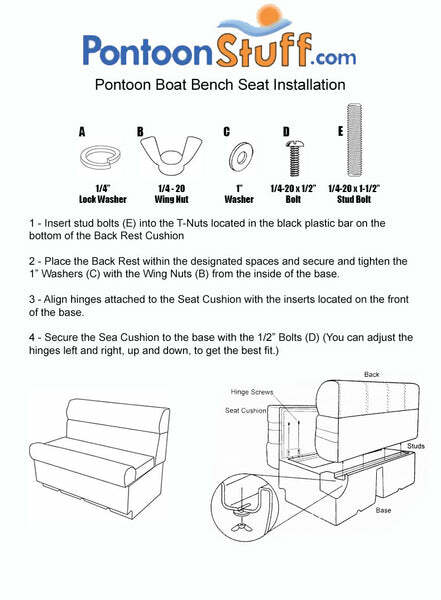 Once you have your measurements please feel free to call us at 1-877-295-9522 or email us at Support@pontoonstuff.com and we can help you choose the best pontoon seat layout for your needs. You would need to place everything in the cart individually to get the setup you want.